Let's Talk About Race (Library Binding) | Let's Play Books! In this acclaimed book, the author of the Newbery Honor Book To Be a Slave shares his own story as he explores what makes each of us special. A strong choice for sharing at home or in the classroom. Karen Barbour's dramatic, vibrant paintings speak to the heart of Lester's unique vision, truly a celebration of all of us. "This stunning picture book introduces race as just one of many chapters in a person's story" (School Library Journal). "Lester's poignant picture book helps children learn, grow, discuss, and begin to create a future that resolves differences" (Children's Literature). Julius Lester said: "I write because our lives are stories. If enough of these stories are told, then perhaps we will begin to see that our lives are the same story. The differences are merely in the details." I am a story. So are you. So is everyone. Julius Lester is the author of the Newbery Honor Book To Be a Slave, the Caldecott Honor Book John Henry, the National Book Award finalist The Long Journey Home: Stories from Black History, and the Coretta Scott King Award winner Day of Tears. He is also a National Book Critics Circle nominee and a recipient of the Boston Globe-Horn Book Award. 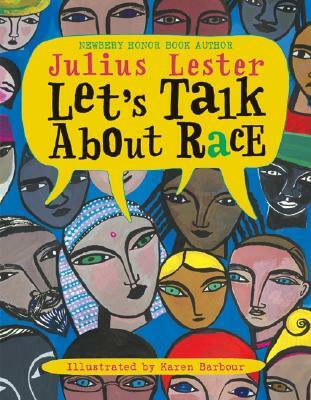 His most recent picture book, Let's Talk About Race, was named to the New York Public Library's "One Hundred Titles for Reading and Sharing." In addition to his critically acclaimed writing career, Mr. Lester has distinguished himself as a civil rights activist, musician, photographer, radio talk-show host, and professor. For thirty-two years he taught at the University of Massachusetts at Amherst. He lives in western Massachusetts. Karen Barbour has illustrated many books for children, including You Were Loved Before You Were Born; Fire! Fire! Hurry! Hurry! ; I Have an Olive Tree; and Marvelous Math: A Book of Poems, which was a Parents' Choice Gold Award winner. She wrote and illustrated Little Nino's Pizzeria, a Reading Rainbow selection. Her paintings have been exhibited in New York, Los Angeles, San Francisco, Tokyo, and Rome. She lives in Point Reyes Station, California.